Once again, an industrious nerd has come through with the goods. A Japanese fellow has designed and built a set of elaborate, sci-fi-themed paper models, including a Y-Wing Fighter, a Tie Fighter, the Millennium Falcon, a Star Destroyer, a Sandcrawler (um, point? ), an AT-AT, a Borg cube, the Enterprise, the Delorean from Back to the Future, and other goodness. Best of all, said Japanese nerd has provided the paper templates on his site in PDF form so that you can print them out and build these models yourself! As if you had the nerd-like amounts of time to spend on such brilliantly frivolous pursuits. 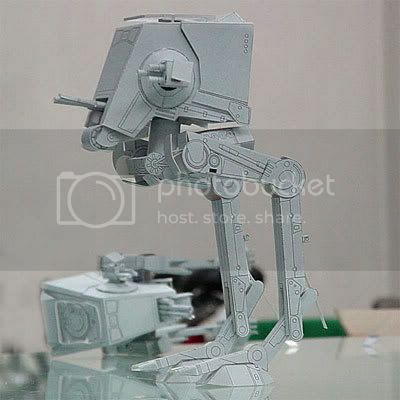 On the other hand, it might be worth it to build an AT-ST, just to recreate the scene from Return of the Jedi when the Ewoks crushed an Imperial walker between two swinging, suspended tree trunks. Smoosh. The work [tsu] solving, is, but as for this being terrible, the shank. [deihuorume] it did the curved surface even boldly and the [chi] [ya] was. It is [kakukakupurobu]. Omission it is and it is the cousin. It does not inhale. We can agree on one point, sir. No, it does not inhale. hell f*ckin yeh! I am going immediately home from the factory today, and I will begin construction on my fleet of paper, imperial star destroyers. My wife curses you in advance. Nickolai, my husband doesn’t even get to see this post. You’re welcome, I’m sorry, etc. etc. Does it come in a version that DOES inhale? Sadly, waving a paper star destroyer while humming the imperial march theme doesn’t instill you with the sense of majesty that I was expecting. Cindi, your husband is welcome to try. I’ll keep ‘The Adjudicator’ around for a few days before i hyperspace it to the recycle bin. My Mom has a similar shelf for me. Can’t wait to finally get my hands on that stuff. Next post: Star Wars: Celebration. More like, um, Lame-abration. Yeah.